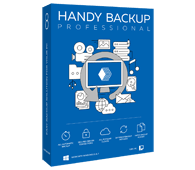 Synthetic backup is a new feature that we plan to add to Handy Backup in the nearest future. The idea is to synthesize a full backup while running an incremental or differential backup job. This approach is faster than copying entire data, consumes a lot less bandwidth in network-based schemes, and allows planning backups in a more flexible and smarter way. At present, our software supports full, incremental and differential backup. Full backup is a method when you always copy an entire set of data. Recovery in this scheme is as simple as copying all files from a backup to original place. The downside is that it is slow, requires a lot of disk space to store backups, and slows down network in network-based backups. Differential backup contains all changes made since the full backup. Unlike incremental backup, it only depends on the first copy, and allows calculating byte-level differences, rather than working with complete files. The new Synthetic Backup feature will allow you to create a full backup not by reading original data, but through the use of existing incremental or differential backups. To a certain extent, this operation is similar to common restoration, with the main difference that the data is copied not to the place it was taken from, but to the same storage, thus saving time and resources required for transferring data. The feature will be available in the Professional edition of our software. We welcome you download and try it right now – it’s a perfect solution for any home or business computer! To back up your files, e-mails, system and databases, you need the Professional edition of our software. Free 30-days trial version!